Can you believe it's November already, October flew by in the blink of an eye! It's now time for a new challenge over at Smudgy Antics! Our challenges are always anything goes with an additional twist, but they must always be on the dark side and you must use Smeared Ink digis or rubber stamps! Here's my 1st inspiration project for November featuring Smeared Ink's new digi called Steed! The twist this month is Metal Madness. I decided to just add touches of metallic silver for the metal elements in my project. My project began in Photoshop CS6 where I added Smeared Ink's Void digi paper to the background inside the frame and then printed out the digi onto Neenah solar white cardstock. I then coloured the image with Copics in shades of blue, green-blue, cool greys and the colourless blender with touches of metallic silver - I used a metallic silver Promarker and a gel pen. I then trimmed and distressed the edges of the panel and applied Tumbled Glass Distress Ink with a sponge applicator. I layered the panel onto teal shimmery cardstock and dark blue cardstock and added silver lines to the blue mat. 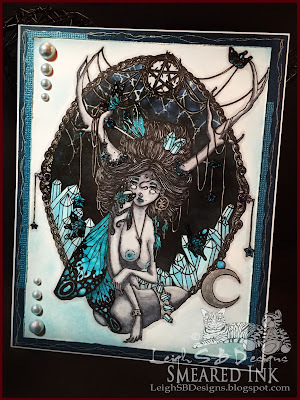 To complete my project I layered everything onto white cardstock folded to form a card, embellished with pastel blue pearls and added shimmer to the wings, butterflies, hanging crystals and the base of the antlers with Viva Pearl Magic Transparent White.